Ohtsuki is feeling the pressure. 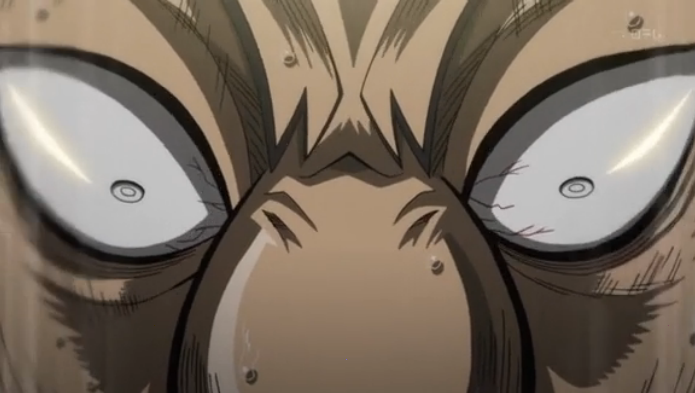 Kaiji Season 2 episode 7 brings us the fateful game of chinchirorin between Kaiji and Ohtsuki, as well as an explanation to the secret of Ohtsuki’s magic touch, all dished up with a side of anxiety so bad I almost got sick. It is truly remarkable the way Kaiji manages to build up the anxiety around games that are so simple. 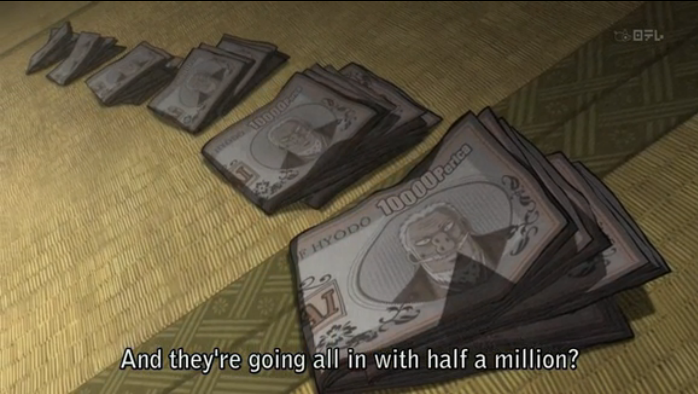 I love the vanity money featuring the lear of Kaiji's old nemesis. Now that Ohtsuki has taken the dealer’s spot, Kaiji and his fellow losers have put all of their savings down on a single game of dice. This causes Ohtsuki to sweat. This is one of the key elements of Kaiji, the psychological turmoil of gambling. Ohtsuki tries guessing what is going on in his opponent’s mind, and then starts second guessing himself. Notably this episode deviates from all previous episodes by denying us the interior perspective of the one character that really matters: Kaiji himself. This adds to the anxiety (certainly to the anxiety I was feeling while watching) by twisting the audience around with Ohtsuki’s perspective instead. Has Kaiji really figured out Ohtsuki’s trick? Kaiji never revealed the exact nature, so perhaps he can still be beaten by Ohtsuki after all. Magic Dice -- but will the spell last? We also get to see, through a flashback, Ohtsuki’s exact method of cheating. He has special dice with only three sides. With their lowest possible throw being a 4, Ohtsuki and his henchmen are almost guaranteed a win … as long as they can keep people from finding out they are cheating. Ohtsuki’s assistant becomes essential, then, as the person who swaps out the magic dice for a normal set. 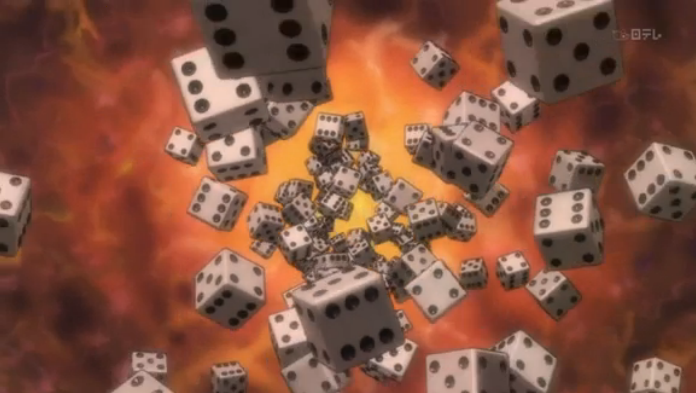 Much of Ohtsuki’s inner turmoil involves his wavering decision to drop the magic dice. This episode was the equivalent of a major game in a sports series, where the protagonist team is losing ground. Thinking back to Giant Killing, we’re late in the second half, and ETU is down by one. That is to say, the major purpose of the episode was to yank us around by the chain. Tension was built and the opportunity for Kaiji to come out on top is slipping away. Normally I like to marathon shows like this because it can be agonizing to wait until next week to see how things are going to turn out. A week is a long time to wait on the edge of one’s seat.